Nakamura tops the standings after round six. | Photo: Lennart Ootes/Saint Louis Chess Club. 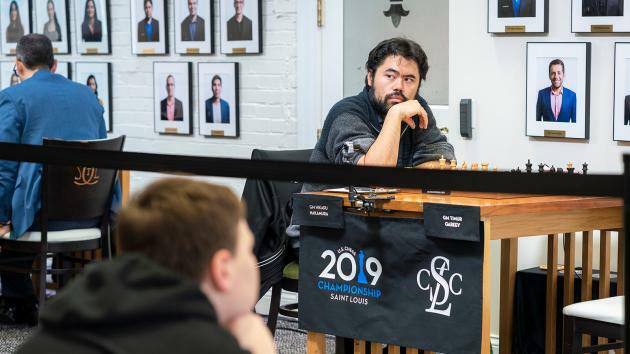 It's Hikaru Nakamura alone who is enjoying the lead at the 2019 U.S. championship during the rest day. The 31-year-old grandmaster beat Timur Gareyev and is the only player on 4/6. Jennifer Yu kept her half-point lead in round six. "It was a strange game, to say the least," said Nakamura about his win vs Gareyev, his second victory of the tournament besides four draws. "I think we were more or less playing on our own from about move three or something!" he said. This happened because Gareyev was avoiding the Exchange Gruenfeld (Black usually takes on d4 to reach that), but then he started "misplacing his pieces" according to Nakamura. Black should definitely have put up a bigger fight for the e5 square in this game. Nakamura had to think from the start in his game with Gareyev. | Photo: Lennart Ootes/Saint Louis Chess Club. Sam Sevian, Wesley So, Leinier Dominguez and Fabiano Caruana are the players trailing Nakamura by half a point. The latter finally finished his streak of 27 games without a win. "It feels good. It's been a long time!" said Caruana. It's been 174 days, to be exact, since he beat Shakhriyar Mamedyarov in the U.S.-vs-Azerbaijan match at the Batumi Olympiad. Caruana's victim was Jeffery Xiong, who had such a great start with 2.5/3 but then only got a draw from his next three games. "It wasn't perfect, but I think overall I played quite well," said Caruana. That was a fairly accurate statement since all the variations he mentioned in his post-game interview were mostly the first choice of the engine! Caruana got his first win since October 2, 2018. | Photo: Lennart Ootes/Saint Louis Chess Club. Tail-ender Awonder Liang finally got to score his first win as well. One of the youngest grandmasters in the world, the 15-year-old from Madison, Wisconsin didn't shy away from some deep French Winawer theory against Var Akobian. Liang followed Parimarjan Negi's recommendation 8.Bd3 instead of taking on g7 right away. The players reached a very complicated endgame where White was an exchange up but Black had three central pawns. It remained super difficult until it was basically Akobian's time trouble that decided this game. Liang at some point just pushed his a-pawn: "My thought process was either I promote the pawn or I lose!" he said. Awonder Liang finally won a game as well. | Photo: Lennart Ootes/Saint Louis Chess Club. Round six commentary by GM Robert Hess. It was a bloody round with three decisive games in the main tournament and five in the women's. IM Anna Zatonskih moved to an excellent 5/6 score with her win against WIM Ashritha Eswaran. It started off as a classic example of a minority attack in the Exchange Queen's Gambit, with Zatonskih avoiding weaknesses around her king, and in fact avoiding a black attack altogether. Eswaran then defended her weakness on c6 with a move that was tactically flawed. Anna Zatonskih, in second place with 5/6. | Photo: Lennart Ootes/Saint Louis Chess Club. Amazingly, 5/6 is not enough to be leading the tournament. After dropping her first half-point, FM Jennifer Yu returned to winning, this time as Black vs FM Maggie Feng. It wasn't easy. "It was a really lucky game. She played really well," said Yu. "It was just crazy." A fortunate Jennifer Yu still tops the standings. | Photo: Lennart Ootes/Saint Louis Chess Club. GM Irina Krush can probably say goodbye this year to the idea of winning her eighth title after losing to WGM Tatev Abrahamyan in a sharp Sicilian Dragon. "I don't know what was going on!" said Abrahamyan before starting her interview. Those Dragons are always difficult. An interesting Dragon in Abrahamyan vs Krush. | Photo: Lennart Ootes/Saint Louis Chess Club. The official broadcast of round six.